But actually, these bites have a story. You see, two years ago I created a maple latte protein bite. Totally a favorite of mine! I decided these protein bites were about due for a makeover and photo update so I busted out the ingredients and started to mix. I could smell the espresso on my hands and the aroma of coffee in the air. Yes, just from mixing up the ingredients. It was then I had a flash back to 2004. EEK 11 years ago! I was in college and working at Starbucks. I actually loved that job. Not the hours, but the pay and the company was good! Whenever we had down time at Starbucks, the other employees and I would make up random drink concoctions. I think I was high on espresso most of my college life because of that. Ha! One of my favorite combos I came up with (while working and the BUX) was a double shot latte with dab of maple syrup, vanilla cream, and a splash of hazelnut flavoring. Oh my it was divine! Not the healthiest in terms of sugar, but hey, I was in college and ignorance WAS bliss. You see where I’m going with this? 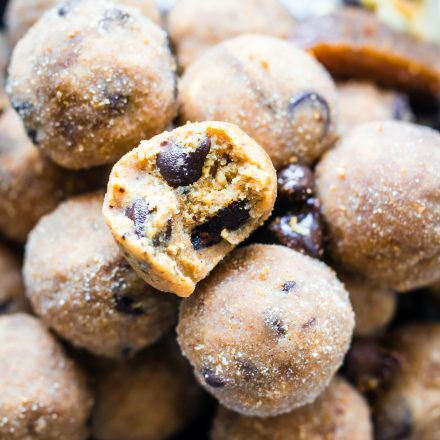 Yes, that memory totally sparked the edition of the NUT to these no bake LATTE protein bites… I mean healthy bites! And since we’re all about maple these days, let’s just keep that flavor going too. Mmm k? 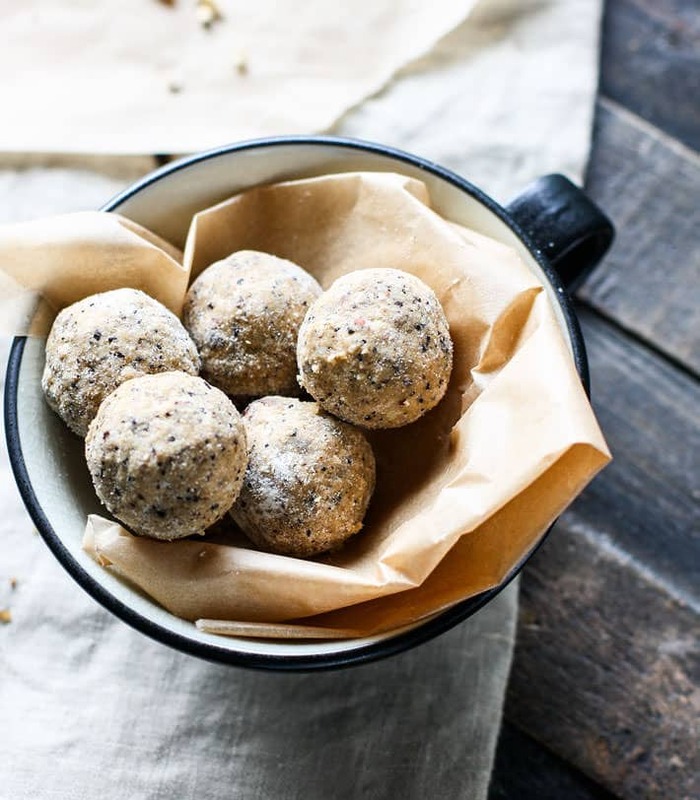 So brew some coffee or espresso and enjoy the “perks” of these latte protein bites. Nutrition per bite using Vanilla Whey Protein Powder and yielding 20 bites per batch. Please note the nutrition will be different if you use pea protein or different nuts. But not by much. 1/4 to 1/3 cup maple syrup. You can also use honey if maple syrup is not available. BONUS – 1/4 melted dark chocolate to coat if desired. Chop nuts in food processor if they aren’t already finely chopped. pulse in blender or processor to make more like a nut meal flour. Coat bites (once frozen) with extra protein powder and/or coffee. Makes about 20 balls. Freeze or keep in refrigerator to maintain freshness. 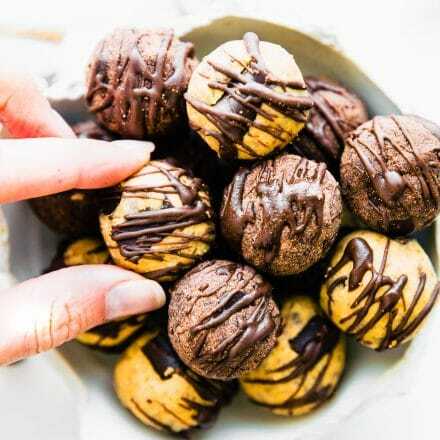 You can also roll the bites in melted dark chocolate and then freeze for a mocha latte bite flavor! Depending on the type of flour and nut butter you use, you might need to adjust the amount. Add all in bowl, then if batter is too thin, add in more almond flour. If batter is too thick, add more honey or nut butter. Oh and just in case you want a MOCHA option. I got that covered too. Check out this step by step video! 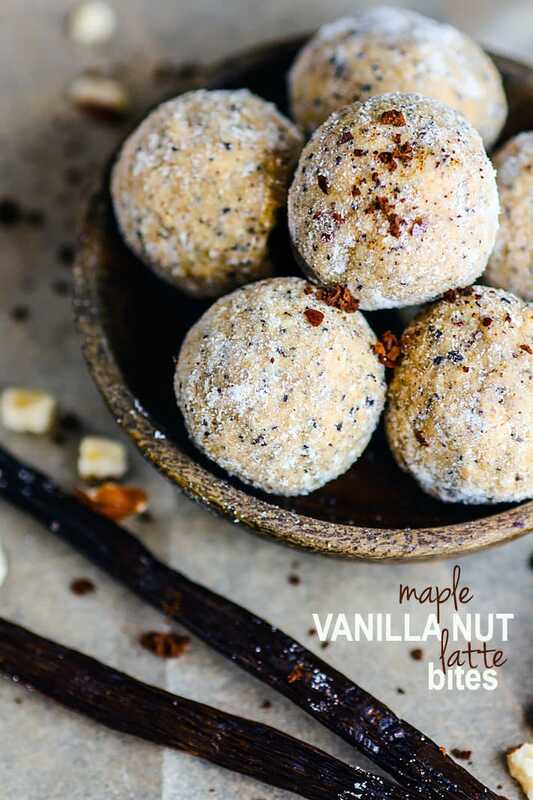 Vanilla and Chocolate Maple Latte protein bites involved! Do you have a favorite coffee drink from Starbucks? Did you know there are SEVERAL not on the menu! Ohh. the secret is out! Cheers to nutty healthy Bite with a LATTE love! Puns are done, I promise! ← Are You Standing in Your Own Way to Success? gorgeous photos Lindsay! I am sipping my coffee while reading this post and thinking how great these bites would be on the side! no gonna lie, i’m drinking coffee right now with 2 bites left. I’ll save you one, come over! Made these last night and they turned out amazing! so delicious, and I rolled them in a coconut flakes to carry on the flavor from the coconut flour I used. They were a little bit on the dry side so next time I would add some more almond butter but overall great recipe! oh I’m so glad! great call on the coconut! Yes, sometimes it’s the type of protein or almond butter that makes them more dry. glad it worked for you! I think I should get a job at starbucks….even though I only drink black bitter dark roast, I think it would be a good deal 😉 I always just like the “ambiance” that is Starbucks, hahahaha! Oh my, these look so so good and I would love these so much more than any store bought latte! I’m right there with you making all my old recipes! Not writing new posts though, but I think I’ll have to start since it’s nearly impossible to do both all the time! Anyway…these may have to happen this weekend…mmmm! So I was a barista in college as well, best job ever!! I worked at Caribou doing the morning shift – talk about coffee overload!! I would do the same thing, but was pretty grossed out by the amount of sugar in the drinks – they tasted unnatural to me lol! But I know exactly how I want my latte, mocha, etc! The real vanilla, maple and nut butter sound like a much better flavor combination to me that anything you can get at the BUX. 🙂 Thanks for sharing, these sound divine! thats awesome that you used to work at starbucks, my fav drink would have to be the peppermint mocha but i don’t get that too often because of the sugar content! This flavor combo sounds unreal in bite form and in a latte form, maybe ill just have to make them toghether! You worked at Starbucks? Love learning new things about you…HA! I’ve heard they are a great company to work for and treat their employees well. Happy weekend friend! I love how you used to be a “Starbucks Chemist,” I am sure I would have done the same…coming up with fun flavour combos is so fun and usually delicious. no problem with that! simple can be perfect! I’m ALL about maple these days too…so I LOVE this flavor combo! So delicious! I’m so glad you had that fun job and made up this awesome flavor combination…because now, we get to have THESE yummies! Really, Lindsay, they sound amazing. 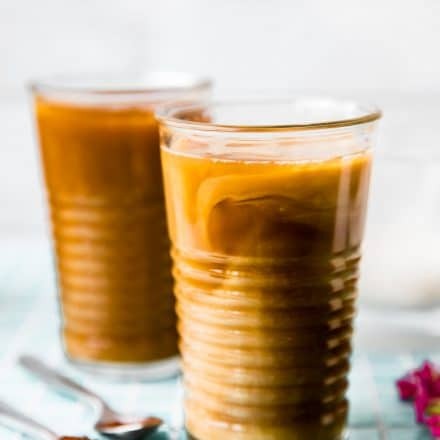 I’m a huge coffee fan…can’t wait to make them! its a coffee lovers dream! let me know if you try them friend! Yum! I am loving the sound of espresso in my energy bites. So excited to make these! These look so delicious and I’m not even a coffee fan. But maybe after this that’ll change! Can’t wait to try them! Haven’t had this flavor in so long.. oh how I miss them! & yes I know about the secret menu 🙂 Hubby used to work for Starbucks ( I actually use to make the excuse to get coffee so I could go say “Hi” when I first met him haha) Favorite drink… Americano with cream + cinnamon. Not really into the sugary drinks anymore! PS. I love your corny cotterness <—- new word? I love these photos (and the recipe). They look amazing! The texture was great! I used sun butter and didn’t quite have enough, so I just added about a teaspoon of water and it worked perfectly! I can’t wait to try them with other combinations of nuts and nut butters! Geez 11 years ago… Gosh doesn’t university life seem so long ago now? Then again 11 years is a long time! And now I really want coffee… With one of these bites. Well it is Monday morning so I guess it’s about time for a cup! If there’s ground coffee in it, count me IN! These look fantastic. I applied to work at Starbucks once in college, but then decided to work for the county instead. I almost wish I had, just for the experience! absolutely in love with these bites. i will make these this weekend and let you know! oh yay! let me know if you do! I’m not sick of seeing your bites at all so remake away my friend. Bring on the balls. sure thing! each bite recipe i make is around 45-55 calories. 1-2 grams fat, 5-7 carbs, and 1-2 grams protein. just depends on teh flavor. So about 3-4 is like having a protein bar. ya know? I made these tonight and while they were fantastic, they were also a little sticky (maybe because of the almond butter I used?) I added some more almond meal and hazelnuts, but that didn’t totally fix my issue. Any suggestions would be appreciated! I’d also try thicker honey versus maple syrup. Is there any chance anyone knows the nutritional facts for these? 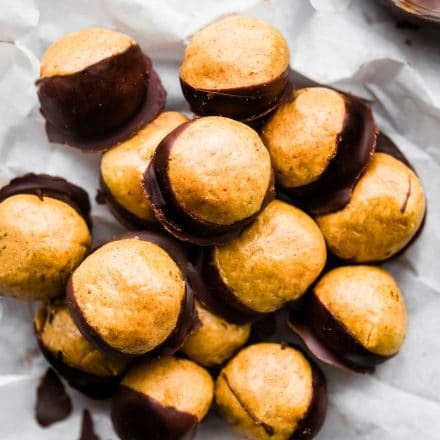 I am doing a low carb/keto diet right now and am trying to find snacks to curb cravings that have very little sugar/carbs…natural sugars are okay in moderation which is why I’m curious about this recipe. Looks delish!! Thanks!! Here’s what i got when I used the pea protein and only 1/4 cup maple syrup. I had to stop by to leave a comment to say I made these today and they were delicious! It’s hard not eat all of them! I rolled them in the ground coffee and can imagine these will be a great morning kickstarted or afternoon pick me up! I look forward to trying more of your bites! Thanks Lauren! I so love them too!! Keep me posted on if you make any more. 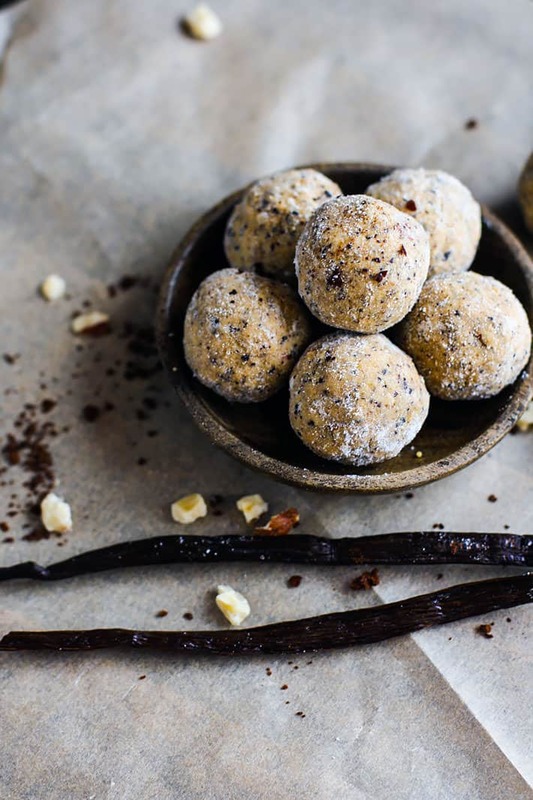 What kind of vanilla bean powder do you use? Are you looking for whey or vegan protein? these look amazing, but what is a substitute i can use for maple syrup that’s completely sweetener free? maybe coconut butter or oil? Have you tried xylitol syrup? I’ve used that before. It works but you might need a little more batter to thicken it. Hi. I just made these with a chocolate protein and they’re divine!!! Plz can you tell me the nutritional value? 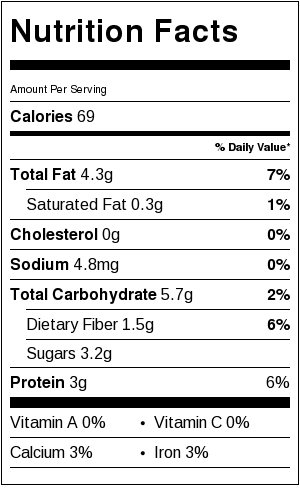 just added the nutrition info for ya! this is based on a whey protein though. It will be different depending on the protein you use. Thanks for sharing this recipe. I’m glad I have all the ingredients already. This may be the pick me up I need today! 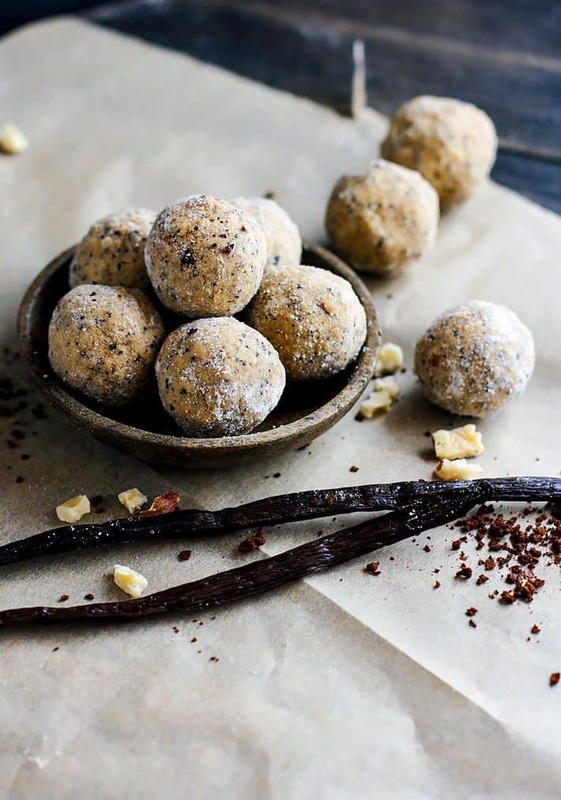 What is Vanilla bean Protein? These look like they taste amazing. I have tried several of your no bake bite recipes with great success, thank you so much. I have never used coffee grounds in a recipe, do I just use regular grounds or instant coffee? You can totally use instant coffee or ground coffee beans, extra fine. Both work. The ground coffee will be stronger, does that make sense? Hi – these look delicious. 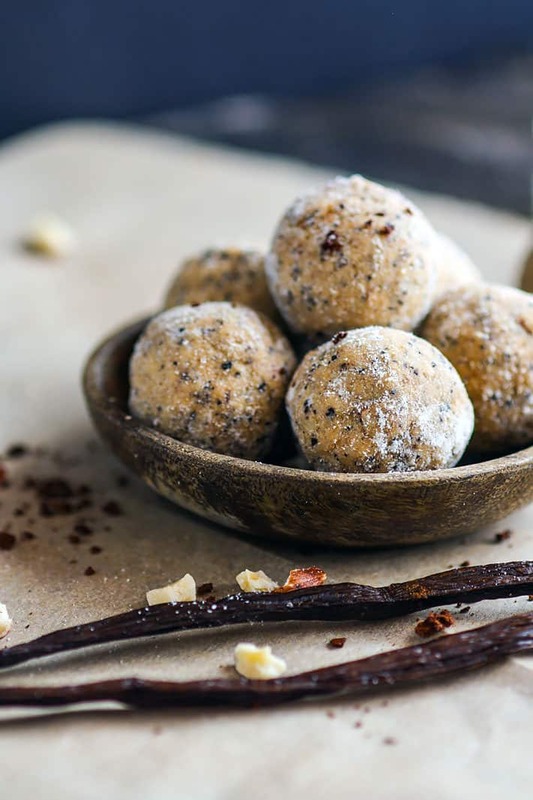 I often make protein balls and these look an interesting, new flavour. My problem is the protein powder! I have never bought it, and can’t really understand why anyone would use it, particularly with the information that I’ve read about it being potentially bad for health. Can you suggest a substitute, please? Sure! what flours do you have handy? Protein powder (plant based) is a great way to get more iron and protein. You can use oat flour, coconut flour, or peanut flour. The consistency and taste will be different though. My concern about the added protein powders are 1. I’m allergic to all beans and most seeds, and 2. I’m trying to keep this recipe vegan too. Vegan, no beans, to share with my grain free, gluten free, dairy free, vegan friends. (We have an allergy table at my Church for coffee hour after service. About 30 adults and kids have food allergies.). are you allergic to chia seed? Did you see my new updated nut free and vegan and grain free bites I just posted? These were soooo good! I only managed to get 12 out of the batch though. Not sure if I measured the almond butter correctly or not. Used pecans and sun warrior vanilla protein powder. I feel like I’m cheating by eating these, but they are nothing but good for me! I’m planning on working my way through all your no-bake energy bite recipes. Keep em coming! This looks so good, but we have a nut allergy in our house….what would you suggest substituting for the chopped nuts? you could try chopped pumpkin seed or just hemp seed. Can you have seeds? These are absolutely amazing. I used medjool dates for sweetness so I could reduce the amount of maple syrup used. I also used oat flour instead of almond or coconut flour. Thank you so much, Allison! YUM. Love hearing about your modifications!